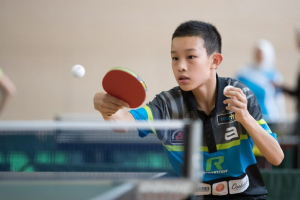 Organised by the China Table Tennis College Europe in conjunction with the ITTF Education and Training Programme, the second Rough Diamonds training camp was held in Luxembourg from Sunday 10th December and to Tuesday 19th December. Australia’s Finn Luu was selected to the attend the camp. Check out his report below about his experiences in Luxembourg and what he learnt from some of the world’s top coaches. The second Rough diamonds camp ran for ten days in Luxembourg. Most days were two sessions, but some were one and some were three. The camp was really physically and mentally demanding, but I learnt a lot from all the great coaches and players. There were five head coaches but only three mainly coaching the boys. There was Zhang Yining, Dejan Papic and coach Yu. The main topics of the training camp were awareness of where you are placing the ball, why you are playing the shot you are playing and awareness of applying training to competition. Another big topic that the Chinese like to drill you on is centre of gravity and keeping in that. On the first day of training after a 50 hour flight with stopovers and missed flights I was quite tired. I was still looking forward to the training and gained quite a lot out of the two sessions. The first tip that I got from coach Yu was to have a longer backswing on the forehand and open my wrist more. In the second session we did some single ball and a session of multi ball. I was really jet lagged by then, so I just worked a bit on my technique. The next day was my first session with a Chinese player. His shots were strong and clean. Coach Yu then fixed up my backhand block and topspin technique. He told me to fix my wrist and try to direct my bat forward. On the backhand block he told me to fix my wrist again and open the bat angle. The next session I did multi ball with Carlo, the coach for the Belgium players. It was a good session and he told me a few tips like not to finish my forehand past my head and to open wrist more on the forehand counter spin. on backhand back from table start with bat at left hip and the hit the ball and recover in a circular motion. The last three sessions of the training camp were a competition. It was a great opportunity to apply what we had learnt to a competition. In my group, I won against one player that I think was better than myself. I think that I applied the awareness of where I was placing the ball really well so I was happy for that. I also played well against the other players and got a couple of sets off players I thought were unbeatable for me. In the consolation round I won my first match against a player form Luxembourg 3-0 and then played an athlete from Egypt. Last time I played him in a tournament I lost the first set 11-1. This time it was quite close, and I won a set. The last match was against the same boy I beat in the group. I lost this time 3-2. Overall the training camp was a great learning experience and I got a lot out of it.